The Road Ranger Blog: More from Max and Me. Max's farming neighbour runs a couple of oldies. This day cab double drive Fiat is one of them. These were initially produced with an 8 speed Fiat transmission, but I think most of the NZ examples had 9 or 13 speed Roadrangers. 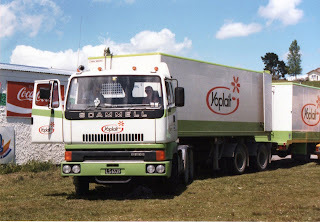 His other oldie is this TK Bedford. 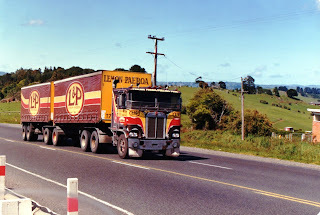 TKs served many New Zealanders very well, sometimes with extra axles added and heavily laden trailers attached they soldiered on with loads greater than their designers ever intended. This Western Star is running a bit lighter than its capabilities. I don't recognise the livery. 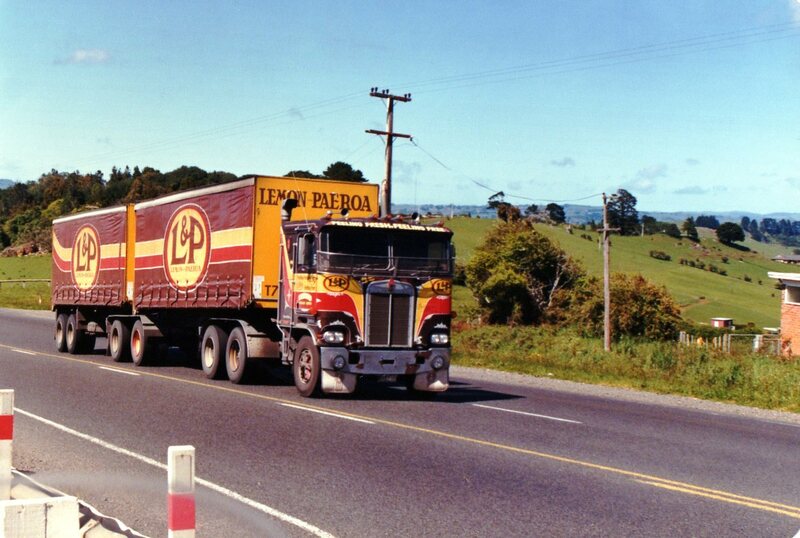 This 8 wheeler Fuso is typical of the used Japanese trucks being imported into NZ. Small wheels under the load area make them great for low loader use (as here) or for box bodies that require maximum capacity. 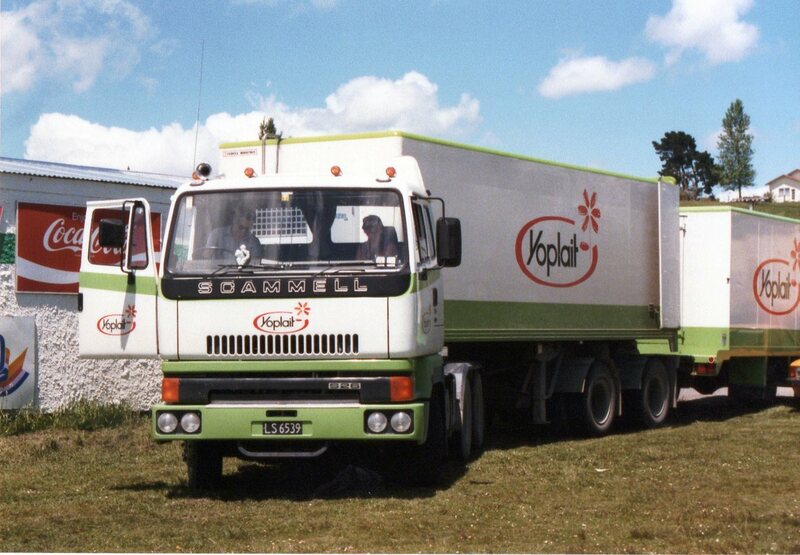 Here is a similar unit with a large box body, but this one has the small wheels all round. 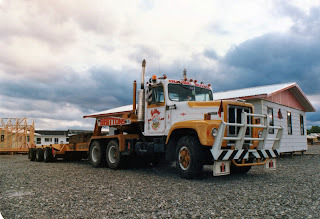 Now some more of my own older shots.Tauwhare Contractors, contracting to Franklin's, had this unusual van body with self steering and tip. The idea was to use it as a normal box body in one direction and then load it with grain for the return journey. The grain was loaded through opening hatches in the roof and then discharged through a chute beneath the rear doors which would be left closed. The driver, who posed his rig for the photo, told me the 1984 Mack R686RST had to have the chassis shortened to fit within maximum length regulations. Before their well known Aerodynes (Little Brown Jug and Barney Boy), Combined Haulage had this flat top cabbed Kenworth K series. Seen here on the Bombay Hills. 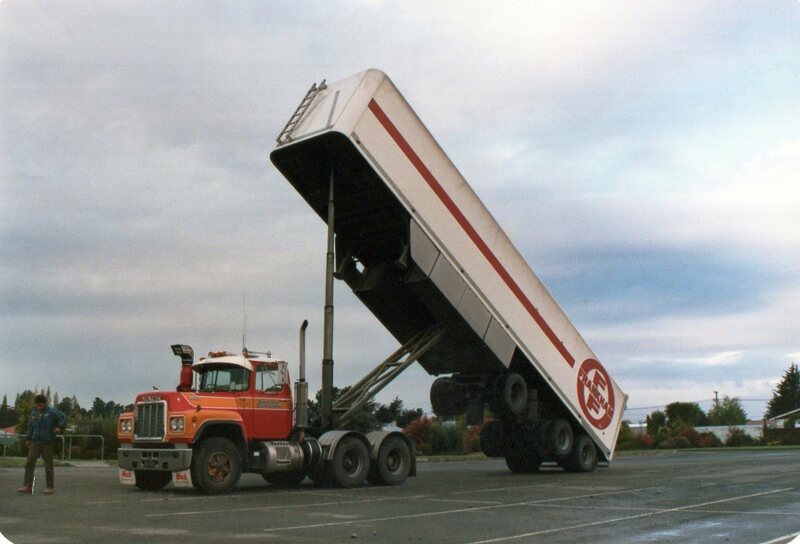 Scammell S26 with the front trailer of a B-train, shares its load with a smaller distribution truck. Both in the smart Yoplait livery. 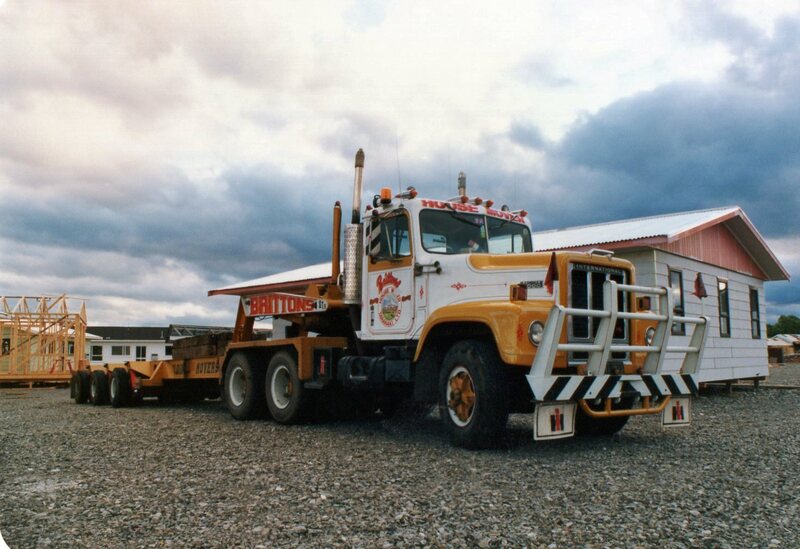 Britton's House Movers at one stage moved buildings about with this International Paystar. I always think these look a smart for a "sleeves-rolled-up" working truck. 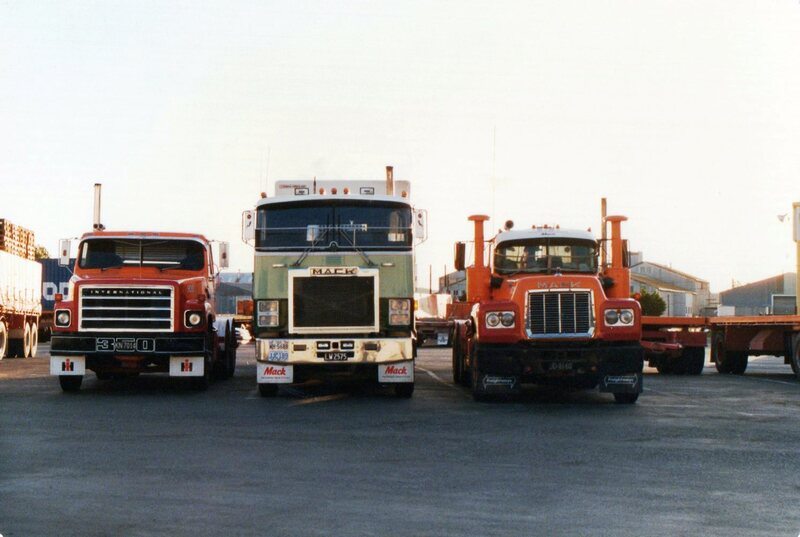 At Freightways yard in Napier, a Rodair Mack Cruiseliner is accompanied by Mack R series and International S-line in Freightways livery. R.A. & J.M. 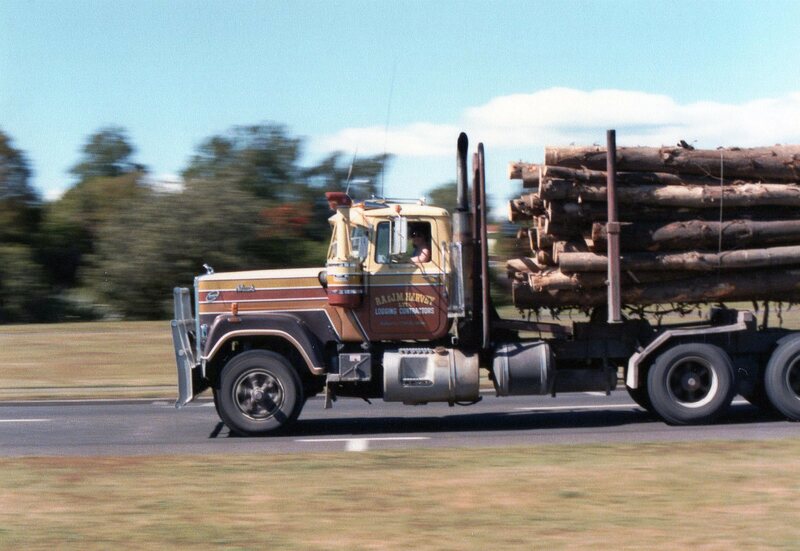 Harvey's Mack Superliner streaks through Taupo with another load of logs. Young lady in the passenger's seat has spotted my camera.